Tires | Platinum Drivers Inc.
What Are the Most Common Causes of Flat Tires? Flat tires are a huge inconvenience, regardless of whether you are riding a bike, driving a motorcycle or a big rig like a semi. Often, there are moments when a flat tire is completely out of your control, such as when there’s an accident, while others could be avoided by making sure you have enough air in your tires. Regardless of what the cause is, you need to have your flat tire taken care of so that you can carry on. Puncturing of the tire by a sharp object like a nail. Overtime a short time, your tire will have a leak of air from the imbedded nail. This is the most common of flat tire causes. 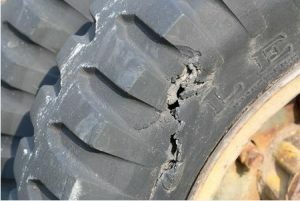 A rubbed or ripped tire can cause a tire to go flat. This kind of damage can be done instantly or be a problem you hadn’t previously detected. The separation of the tire from the rim that is caused by a collision with another vehicle or a curb for example can result in a flat. Tires that are over pumped are likely to pop and go flat. This is due to there being too much pressure in the tire. On the flip side, a tire with not enough air can certainly go flat too. An unfortunate flat tire occurrence, which we’d all like to avoid, is vandalism. If you are experiencing a flat tire for the first time or as a second or third time, you will want a professional auto care service to examine the flat and repair as necessary. Flat tires can be easily changed, but if the underlying cause of the flat is a more serious issue, you will need additional repair done so as to prevent future flats. Platinum Drivers is experienced with placing dedicated people with their best matched commercial driver employer.